A Chinese-built dredging vessel, the largest of its kind in Asia, returned to the shipyard in Qidong city of east China's Jiangsu Province Tuesday after completing its first sea trial. The 140-meter-long vessel, named Tian Kun Hao, can dig as deep as 35 meters under the sea floor and dredge 6,000 cubic meters per hour. 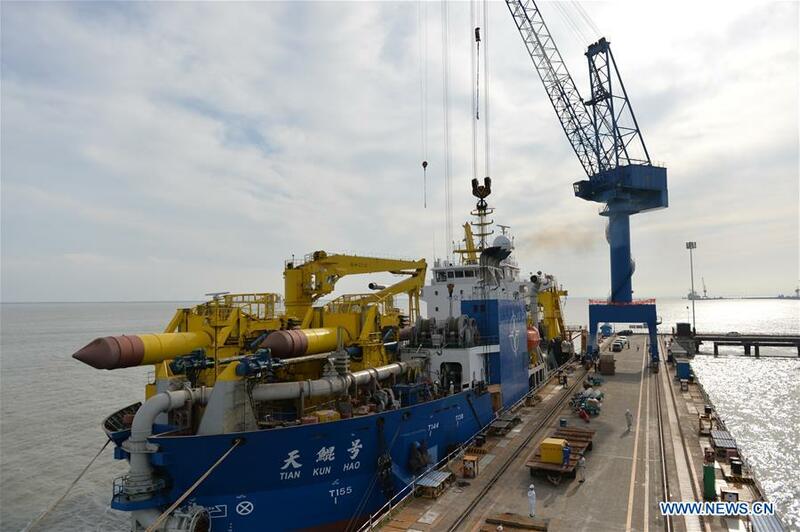 "The sea trial was challenging yet successful," said Wang Jian, deputy chief engineer of the vessel's investor, Tianjin Dredging Co., a subsidiary of China Communication Construction Co. "The power and propelling systems of the ship withstood the test of the sea." During the four-day trial, the vessel's navigational aids such as the radar and gyrocompass were also tested. More than 120 staff, including vessel crew and engineers, were on board. After the trial, the manufacturer, the Qidong maritime engineering company of the Shanghai Zhenhua Heavy Industries Co. will fix the problems found during the test.